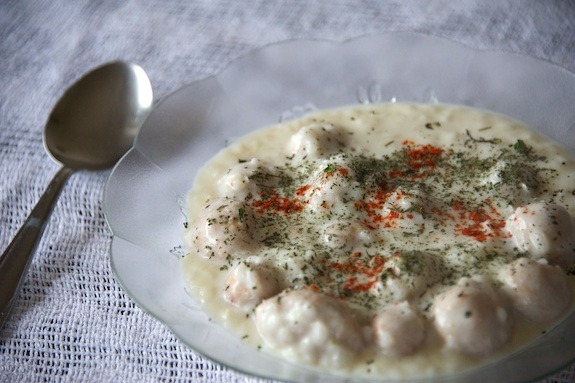 On the first day of the new year my aunt and I were invited to her brother’s house for a traditional Aleppan New Years lunch, Kibbeh b’Labaniyeh (كبة بلبنية): kibbeh balls slowly cooked in a creamy yogurt sauce finished with a saute of minced garlic; the garnish: fragrant flecks of dried mint and a sprinkle of spicy paprika; the taste: heavenly. This is the mac-and-cheese of Middle Eastern food — comfort snuggled in a bowl. Its character is similar to that of a stew, hearty and satisfying. Kibbeh b’Labaniyeh is popular across Syria and Lebanon in the cold winter months, however, Christian families across Aleppo serve this dish as a traditional lunch on New Years to symbolize a clean, pure start to the year ahead. I blogged about it before and included a recipe. You must try it while the weather is still cold. The festivities in Aleppo, however, continue well past New Years day. This is something I thought was interesting and worth exploring. It makes sense that not everyone gets to spend the holidays with their extended network on the day of the actual celebration. 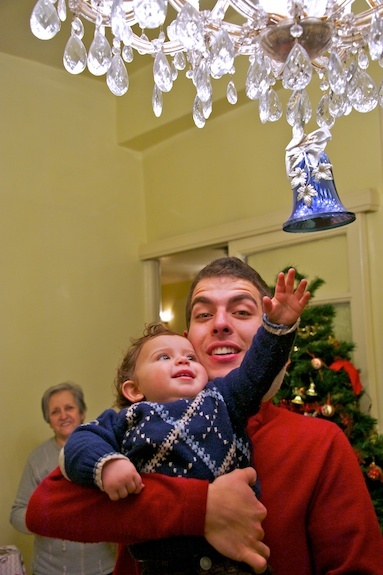 That’s why in Aleppo families usually host small, relatively informal gatherings days after the holidays, in this case Christmas and New Years, where they invite friends and extended family they didn’t have the opportunity to be with. I went to a few of these gatherings with my aunt. 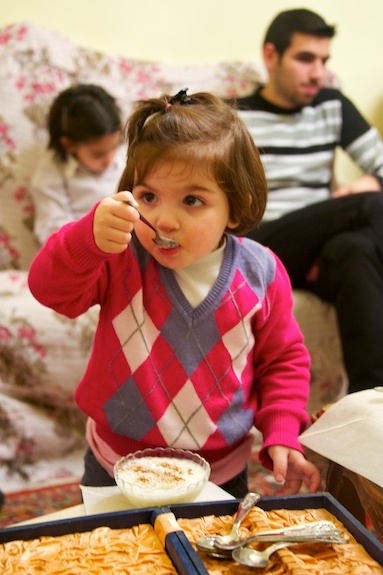 Regardless of how informal these gatherings are, you can rest assured food is involved; in Aleppo, it always is. Coffee, assorted nuts, chocolates, cake, tea, and spreads like hummus are usually the common denominator; these are things that are almost expected at these gatherings. My aunt’s sister-in-law, for example, presented the usual spread of starters, and also offered her guests a variety of her homemade fruit preserves, which included preserved walnuts, a preserve that takes over a month to prepare. Very few people still know how to make it properly (I’m working on a recipe). I became inspired by these gatherings; a wonderful way to celebrate with everyone you love, regardless of the day. Since my aunt has five children, two who live abroad, and each with their own families, I proposed hosting a gathering at her place, and insisted I would help setup. My aunt, actually my grandmother’s sister, usually gets invited by her kids to spend time at their homes; I had a feeling she missed having them over at her house. 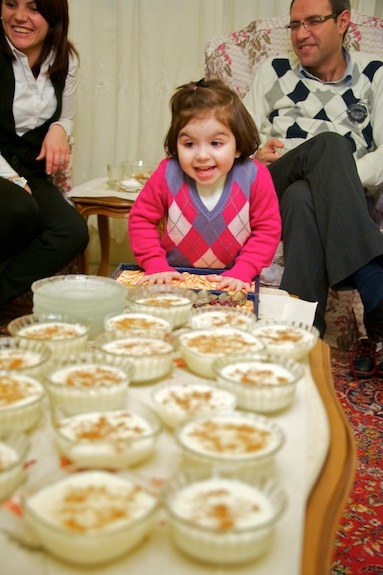 Like a typical Halabiye (Aleppan), the first question she asked was, what should we make? 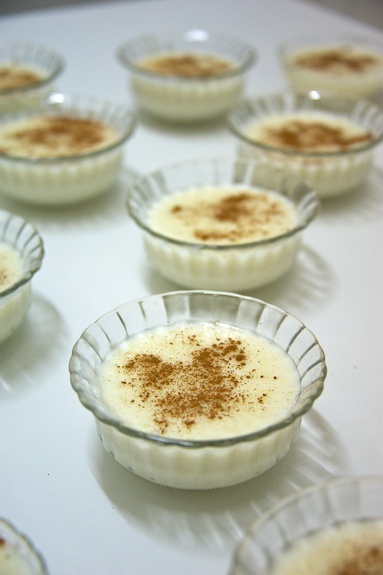 We decided that the star of the occasion should be rice pudding (رز بالحليب) to go along with the white theme. My first job for this gathering was to buy the milk for the rice pudding. My aunt sent me to a dukan, or “small shop” in Arabic. Think of a dukan like a convenience store minus the slurpees and abundance of junk food. 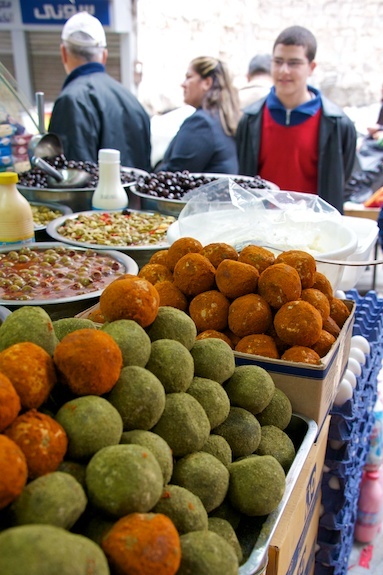 The dukan I visited sells olives, shankleesh (type of Middle Eastern cheese–see picture below), yogurt, milk, eggs, and other pantry staples. When I asked for milk, the first question I got was “how many kilos?”. I have never bought milk in kilogram before, only liters and gallons. I first asked for three kilos of milk, unsure of how many kilos my aunt needed for the recipe. 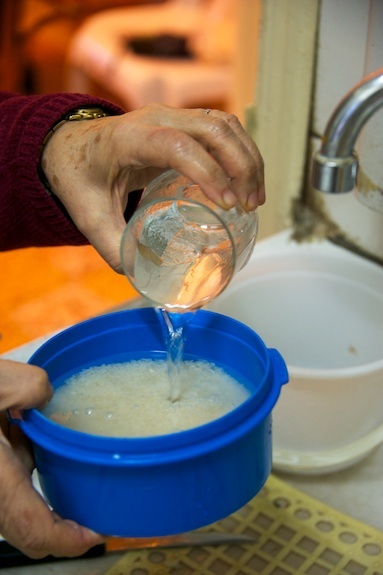 The milkman opened a large stainless steel cooler against the back wall of the dukan and with a big ladle, began to pour milk into a plastic bag. It didn’t look like a lot, so I asked if he could fill me up another bag with three additional kilos. This is fresh, unpasturized milk, which, the milkman told me, had to be boiled before use. 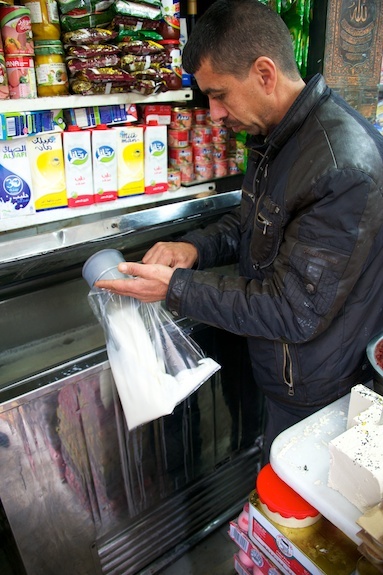 I paid 120 Syrian pounds, approximately $2.50, for what turned out to be a gallon and a half of unpasturized milk (1 kilo of milk is approximately equivalent to 1 Liter). The debate between short grain vs long grain when it comes to rice pudding is endless. 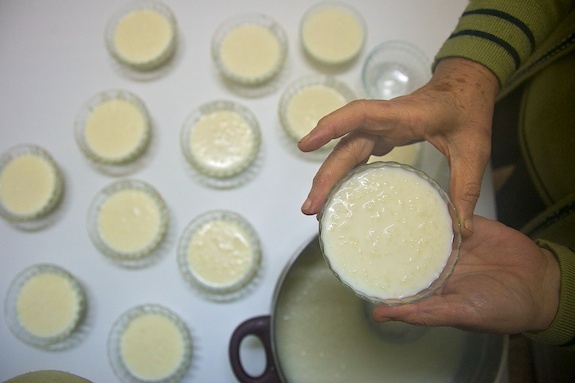 A shorter grain has more starch and will yield a thicker, almost risotto-like, rice pudding, while the longer grain rice will retain its texture more and not give off as must starch into the milk. My aunt uses short grain or what they refer to in Aleppo as riz musry (رز مصري), or Egyptian rice. 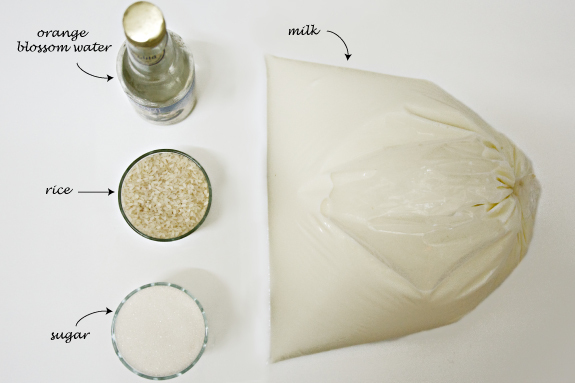 Once the milk comes to a simmer, you add the rice into the milk, along with about 1 cup of water. The extra cup of water helps cook the rice better, according to my aunt, who says that it is meant to replace the water that evaporates during the cooking process. I feel that the extra cup of water also helps cut the richness of the milk. 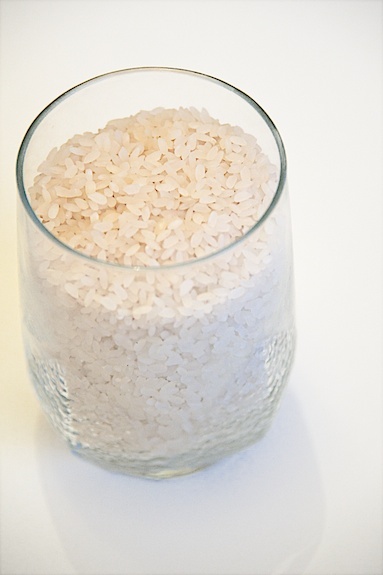 Rinse rice in water 3-5 times or until water doesn’t turn completely a deep white from the starch. Bring milk to a simmer in a large pot over medium heat. Add rice, along with 1 cup of water, and lower heat to medium low. Stir occasionally in the beginning and more often as the rice cooks to avoid rice sticking or burning to the bottom of the pot. Cook for about an hour to an hour and 15 minutes, or until pudding reaches a consistency slightly thinner than desired — remember it will continue to thicken in the refrigerator. Add sugar and continue to cook for 5-10 more minutes. Remove from heat and add orange blossom water. Scoop into individual serving bowls, garnish with ground cinnamon and refrigerate for at least a few hours or until ready to eat. 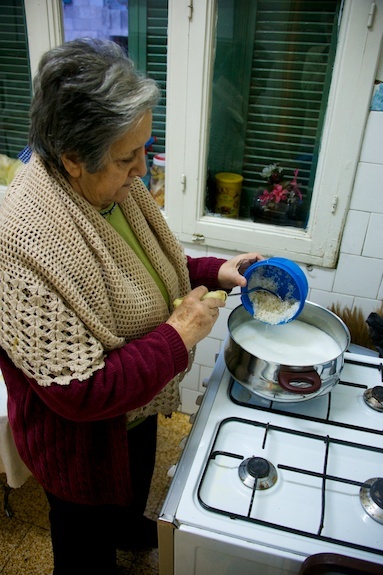 Posted in desserts, Fulbright, Middle Eastern, recipe by Antonio Tahhan on January 8th, 2011. You can follow any responses to this entry through the RSS 2.0 feed. You can leave a response, or trackback from your own site. It looks as if your rice pudding was very much enjoyed. Happy New Year! Thank you for this great post! beautiful photos as always. Thanks Dana and Dimah 🙂 Happy New Year to you, too! please do share the kibbeh bil laban recipe! Tony – Thanks for sharing this. It took me several tries to make rice pudding with the right consistency. I have been following your adventures, and look forward to more posts! And, yes, please do share the kibbe bilaban recipe! yummm i love ur pics wel rez bhalib looks nom nom! Thank you, Amar. Yes, this is the recipe my host mom uses. It is not as dense as other rice pudding recipes; I personally like the lighter consistency. The natural starch in one cup of short/medium grain rice is enough to thicken the milk and create a great rice pudding. Make sure not to over cook the rice so that the consistency does not become really thick and gummy. I hope this helps!